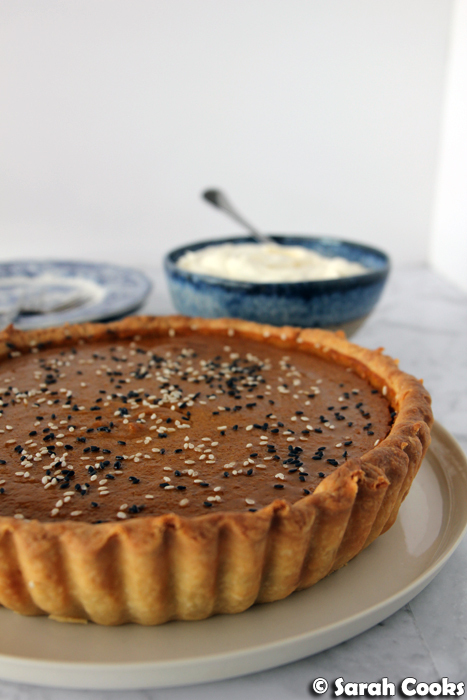 Cardamom-Tahini Pumpkin Pie! It's a grown up, complex, subtle dessert. We have a crisp buttermilk pastry case, and a smooth and creamy pumpkin filling, resonant with the gorgeous fragrance of cardamom. 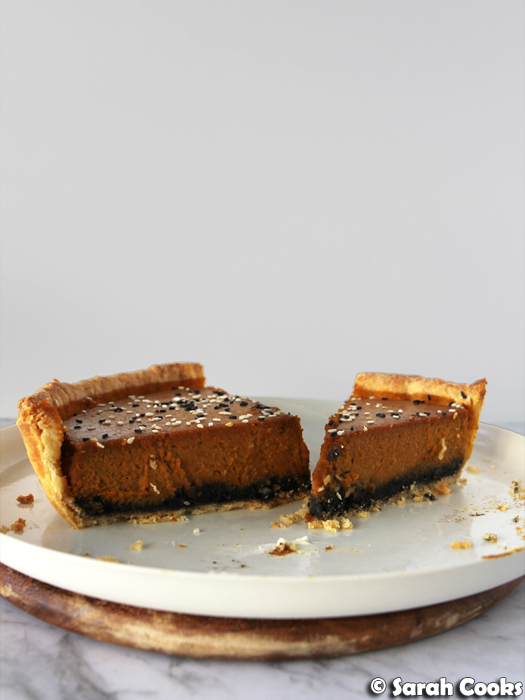 This pie is taken to the next level with a surprise sticky-salty layer of black tahini and walnut paste. It's not too sweet, and all the flavours work so well together. It is just too good! 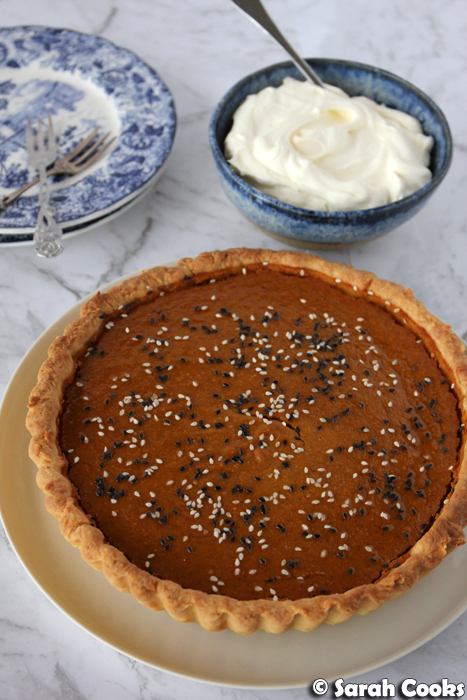 Sneaking in with a Thanksgiving recipe today! Now, I'm obviously not American, so I don't actually celebrate Thanksgiving. However, however. I follow a lot of American food bloggers, who have all been going pumpkin crazy over the last month, and I have had pumpkin recipes on the brain. Also, in a recent post on David Lebovitz' blog, he briefly mentioned a "cardamom, tahini and squash" pie that's served at Sister Pie bakery in Detroit, and I just knew that I had to have it! I have no plans to fly to the States any time soon, so the next best thing was to make it myself. I found the recipe online, read it through a million times - it's quite long and complex, and it took me a few reads to get my head around it - and then adapted it for my Australian kitchen. So, there are quite a few elements to this pie, and I won't lie, it's quite a bit of work. (Which is kinda funny because I'm told that in America, pumpkin pie is considered a low-effort option, as you can buy pre-made pastry cases, tinned pumpkin puree, and pre-mixed pumpkin spice quite easily). I actually made it from start to finish on a Tuesday night after work, and by the time I was done it was super late, and the kitchen was a huge mess! No individual element is too difficult, and all the different parts do add a little something-something to the finished product, so they're all definitely worth doing, but learn from my experience - split up the different elements over a few days! Let's start by talking about with the pastry case. I eschewed the version in the original recipe, and went for my current favourite, Joy The Baker's buttermilk pastry. I've made this a few times and I love it. 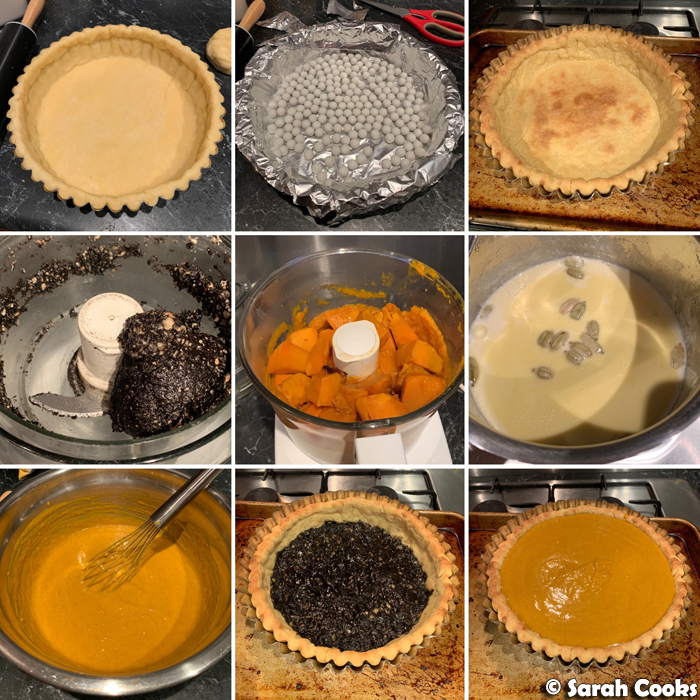 As I said, the pie has a lot of different components, most of which were new to me, so I wanted to start off with something that I knew would work for me, rather than attempting a brand new pastry recipe. You need to blind bake it before assembling and baking the pie. There's also a tahini-walnut paste. This is super simple to make - just toast some walnuts, let them cool and then blend them together with tahini, brown sugar, and cream cheese. 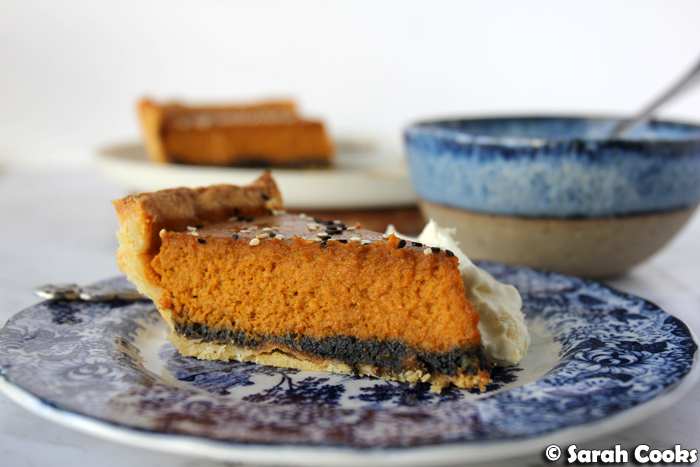 I used black tahini because I had it in the cupboard, and I loved the super-dramatic looking contrast between black layer and orange pumpkin. (Also makes it slightly Halloween-y!) And it echoes the black sesame seeds that are used for decoration. You could definitely use normal tahini - I'm sure it would taste as delicious; it just wouldn't be as visually striking. Now, the pumpkin purée. The original recipe calls for a mix of canned and fresh. I was fully intending to make it easier on myself and use all tinned pumpkin, but I searched for a week before making the pie couldn't find it anywhere! They don't sell it at David Jones in the city anymore, where I swear to God I've seen it a hundred times, and I didn't have time to drive out to USA Foods. Sandra, who by this stage was fully caught up with me in the pumpkin pie fever, kindly called like ten different gourmet shops around town to see if they had it - and they all came up with bupkis. So in the end I just cooked it myself. I'm told that 450 grams of raw pumpkin will equal about one cup of purée, and you need two and a quarter cups for this recipe, so to be safe I've suggested 1.25kg of raw pumpkin. Just freeze any excess purée for future recipes! There's also a cardamom-infused cream - you bash a few cardamom pods, then place them in a saucepan with some cream and bring it to the boil, take it off the heat and allow it to infuse for twenty minutes or so. This cream then gets strained and, once cooled, added to the eventual pie filling, and it adds a richness and a lovely subtle fragrant note. Ok, so once you've got your blind-baked pastry case, your tahini-walnut paste, your pumpkin purée, and your cardamom cream (phew), you can finally assemble and bake your pie. (Do you see why I suggest splitting the work up over a couple of days?) But either way, once you get to this stage, you're on the home stretch. You can do it! You spread the tahini-walnut paste into the pastry case (use your fingers and wear food gloves; it's easier). 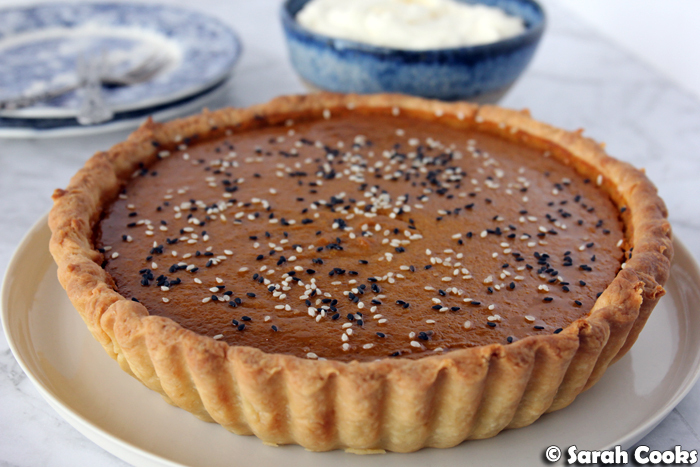 You then whisk together the pumpkin purée and cardamom cream with some powdered spices, sugar, salt, polenta and eggs to make the filling, then pour it into the pastry case and bake. You want it baked until it's juuuuuust set, with a little wobble to it but no obvious liquidness underneath the surface. Once it's out of the oven, decorate with black and white sesame seeds and let it cool completely. Apparently you can slice into it a couple of hours after it's out of the oven, but lots of people (myself included) like it fridge-cold. I left it in the fridge overnight before serving it, and I was glad I did - logistically it made more sense, and as the baker, it was nice to have a little break between the baking and the eating, so that I could actually appreciate it properly when it came time to serve it. I'm pleased to say that after all that work, the pie turned out really well! It's not too sweet (in fact, I actually thought it could have been slightly sweeter), the crust was crisp and short, and the pumpkin filling was smooth and creamy with a subtle mix of spices. (I think Australians often get weirded out by the idea of pumpkin in a sweet pie, but with the flavour and texture profile of this dessert reminds me very much of that Aussie tuckshop and bakery staple: the custard tart). The tahini layer totally makes it though, adding a rich nutty flavour and fudgy texture. Total winner! Absolutely non negotiable: copious amounts of whipped cream on the side. So, I told you I don't usually celebrate Thanksgiving, but this year I ended up doing a whole Thanksgiving feast, with this pie as the dessert. Whoops. You see, we had invited a group of friends over for a casual get together before the craziness of the Christmas season, and 21st November was the first date we could all agree on. And when I said "casual", I truly intended it. Honest! I was thinking wine, some takeout, and maybe making a dessert. I thought this pie would be a good dessert for the get-together, and when I realised that 21st November was the day before Thanksgiving and that one of the invitees was American... well... it all snowballed from there. 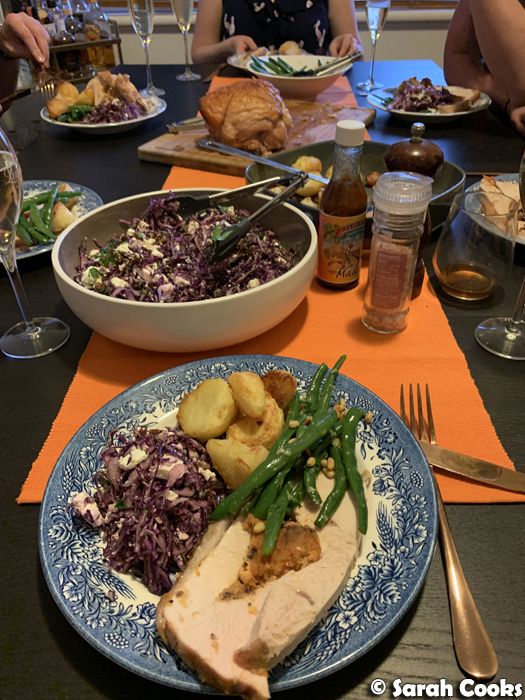 There was the pie, there was a roast turkey fillet with maple-and-sweet-potato stuffing (from Peter Bouchier); Nigella's roast potatoes; Ina Garten's green beans gremolata; Smitten Kitchen's date, feta and red cabbage salad. The whole works! And this was all done over two weeknights with no actual public holiday. I was exhausted! (But it was totally worth it). I was a little nervous serving this adventurous dessert to a group of friends, but it went down well. My friend Adri said the black layer was like the Asian black sesame dessert she enjoys, and she also went back for extra crust. 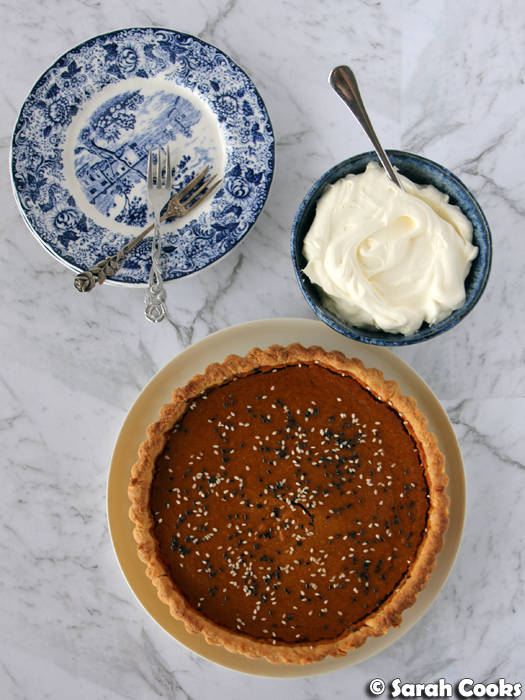 She'd actually never had or seen a sweet pumpkin pie before (and when I brought it out after that turkey feast, she actually thought I might be pulling out a savoury pumpkin pie as a surprise second course!) German Sandra, who is generally not a fan of weird vegetable-based cakes and desserts, said "it was better than I thought it would be", woohoo. I didn't make everyone go around the table and say what they're thankful for (and I'm sure they were thankful for that), but I have to say I'm thankful for good food, and fun times with even better friends. To make the buttermilk pie crust, place the flour, sugar and salt in a bowl and whisk to combine. Chop or grate the cold butter into small pieces. Add to the flour and rub in with your fingertips until the mixture resembles damp sand and the butter is evenly distributed. Make a well in the centre and pour in the 1/4 cup buttermilk, stirring with a fork to combine. Once it comes together in a shaggy dough, knead together and form into a squat disc. Wrap with clingfilm and refrigerate for one hour (or longer). On a lightly floured surface, roll the dough out into a 5mm thick rough circle. Lift the dough off the bench between rolls to make sure it doesn't stick to the bench. Gently ease the pastry to line a 24x5cm loose-bottomed pie tin. Trim the edges to 1-cm higher than the tin, then fold the dough over and gently press it down so you have a slightly thicker border. Cover with clingfilm again and refrigerate for another hour. Now blind-bake the pie. Preheat the oven to 200C. Cover the pastry with foil, gently easing it to sit flush against the pastry, and making sure you cover the border. Fill the pie with pie weights, baking beans, or sugar. Place the dish on a baking tray and bake for 15 minutes. Remove from the oven, then carefully remove the foil and pie weights. Bake for another 10 minutes or until lightly golden brown and completely dry. Set aside to cool. To make the pumpkin purée, preheat the oven to 175C. Peel and de-seed the pumpkin, cutting away any stringy bits in the centre. Cut into rough 4cm chunks. Line two baking sheets with baking paper and divide the pumpkin pieces between them. Bake for 35-45 minutes, swapping the pans halfway through, or until tender when pierced with a fork. Transfer to a bowl to cool. Whizz in a food processor (in batches if required), until completely smooth. If your purée is quite wet, I would suggest draining it - place a sieve over a bowl, and line the sieve with muslin or coffee filters. Place the purée into the lined sieve and allow excess liquid to drain for an hour or so. 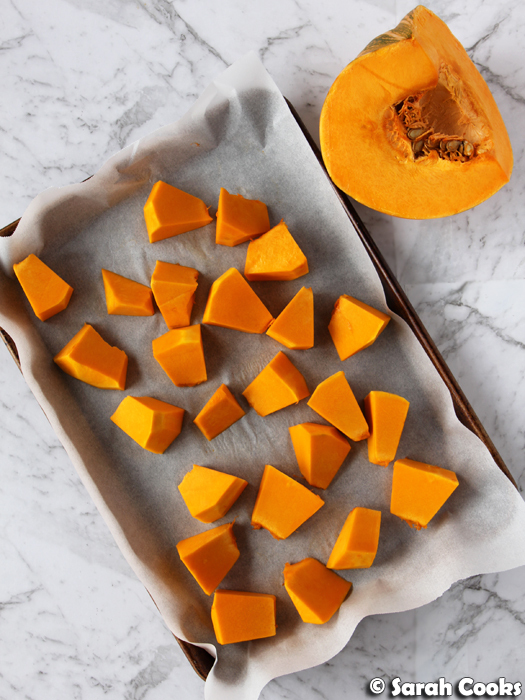 You will need 2 and 1/4 cups pumpkin purée for this recipe. Measure this amount and set aside. Freeze any remaining purée in ziplock bags for future recipes. To make the tahini-walnut paste, toast the walnuts in a dry frying pan until fragrant, then set aside to cool. Place the walnuts, tahini, light brown sugar, and cream cheese in a blender or food processor and whizz to combine. To make the cardamom cream, lightly crush the cardamom pods with a rolling pin or other heavy object. Place the cream and pods into a small saucepan, and place over a medium heat. As soon as it starts to bubble, turn the heat off and clamp on a lid. Allow to infuse for 20 minutes. Strain out the cardamom pieces and set aside to cool. To assemble and bake the pie (finally! ), preheat the oven to 160C. Place the brown sugar, polenta, spices and salt in a bowl and whisk to combine. In a separate bowl, whisk together the 2 and 1/4 cup pumpkin purée, eggs, vanilla, and cooled cardamom cream. Pour the egg mixture into the sugar mixture and whisk until combined smoothly. Place the pie crust, in its pie tin, onto a baking tray. Gently pour the mixture into the prepared pie crust (you might not need all of the mixture; don't overfill the crust). Transfer the pie into the oven, and bake for 40 minutes to an hour, or until the filling is just set, with a little jiggle to it. Remove from the oven, sprinkle with sesame seeds and allow to cool for at least 2 hours. I suggest chilling it in the fridge for a few hours or overnight. Serve with epic amounts of whipped cream. I've got to try this pie crust. I have my go to one which I used in a blueberry pie but I do love to try new crusts!